Horror often revels in death and decay. What it almost never does, however, is engage with these concepts as they exist for most of the population—that is to say, with the actual process of dying. In the case of The Taking Of Deborah Logan, a found-footager from 2014, the specific ailment afflicting the elderly namesake is Alzheimer’s, and its devastating effects are not sugar-coated or glossed over in the slightest. We all hope to live hale and hearty to a ripe old age, but the uncomfortable facts remain: If you’re lucky enough to live into your 70s or 80s—or beyond—the odds you’ll do so without some sort of difficult, inconvenient, or downright painful malady grow slimmer with each birthday that passes. A film that depicts the pain of that process, while still delivering the goods on atmosphere and a respectable number of outright scares, counts as true horror. The film follows Mia, a graduate student who sets out with her documentary film crew (of work-for-cheap hires her own age) to do a story about Deborah (Jill Larson), an elderly woman suffering from advanced Alzheimer’s. Though Deborah is resistant to the idea, her daughter, Sarah (Anne Ramsay), who cares for her, convinces her the money Mia is offering is necessary to prevent the house from being repossessed. While Deborah is often engaging, her behavior becomes increasing bizarre, with Mia and the crew beginning to suspect it can’t be explained away by the disease, as her doctor insists. Soon they’re uncovering secrets about Deborah’s past and the strange involvement of the old woman with a local killer years before. It’s not just the narrative, which remains a compelling look at both problems of old age and the traumas that stay with us all our lives, that elevates the film above the standard Blair Witch knockoff. This is also an expert slow burn. Every chill or eerie moment for the first hour falls firmly within the realm of possibility, and the continual suspicion that Deborah’s behavior is the result of an all-too-human disease lends a more fearful air than the inevitable discovery of a malevolent source. Getting old, after all, can’t be avoided, and neither can the possibility of falling prey to the same ravages of time as the subject of the doc within the film. But when the horrors come, they arrive swiftly and terribly. Despite the overall dearth of any CGI or digital effects (another welcome quality of this resolutely old-school film), there’s one sequence in the climax that packs hell of a punch, all the more effective for how unexpected its imagery is. 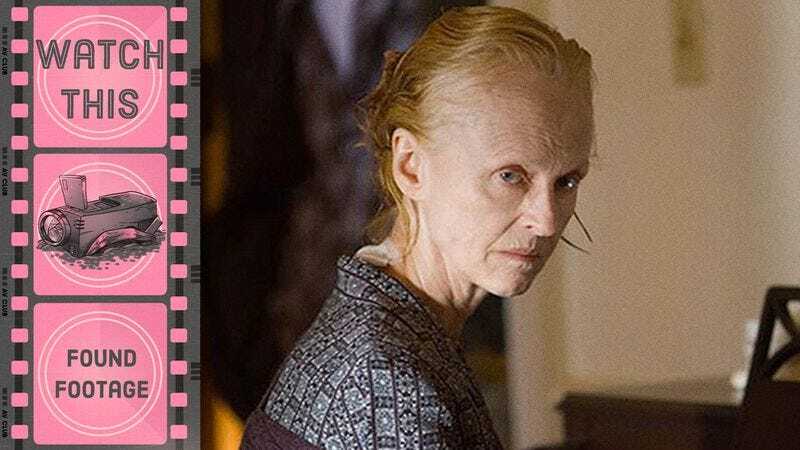 The Taking Of Deborah Logan plays both sides of the horror spectrum, which is how it earns its power: The spectral chills are creepy enough, but the real-world implications are far more unsettling. Availability: The Taking Of Deborah Logan is available on DVD from Amazon or possibly your local video store/library. It can also be rented or purchased from the major digital services, and is currently streaming on Netflix.